Three years ago in January, 2009, I made my first blog post. This post will be my last one on this blog. It has been a wonderful experience sharing photos, stories and tips about life and learning through the lens. I’ve had photo contests where I gave away lenses and trips and other goodies (how fun!). I’ve had a seriously controversial camera review (Sam and I won’t live that one down… but we do get emails daily totally in agreement with our findings) But best of all I have shared with you the amazing work of many fellow photographers through Inspirations and Photographer of the Month posts. Thanks to these photographers for letting me feature their work! I have been inspired and humbled by he response to this blog. Thanks mostly to you dear visitor for stopping by to read and make comments! Going forward Samantha and I will do all our photography and community posts over at oopoomoo where we will have tons of free photography tips and tricks and techniques and of course our popular How-to and Photography Guide eBooks and announcements of workshops and tours. We still plan to keep the inspiration up and have lots to stimulate the eye and mind on the topics of photography and living better on this planet. I hope you will join us at oopoomoo. Finally, I want to thank a Samantha Chrysanthou, Sabrina Henry and Catherine Byram for help with posting blog entries. 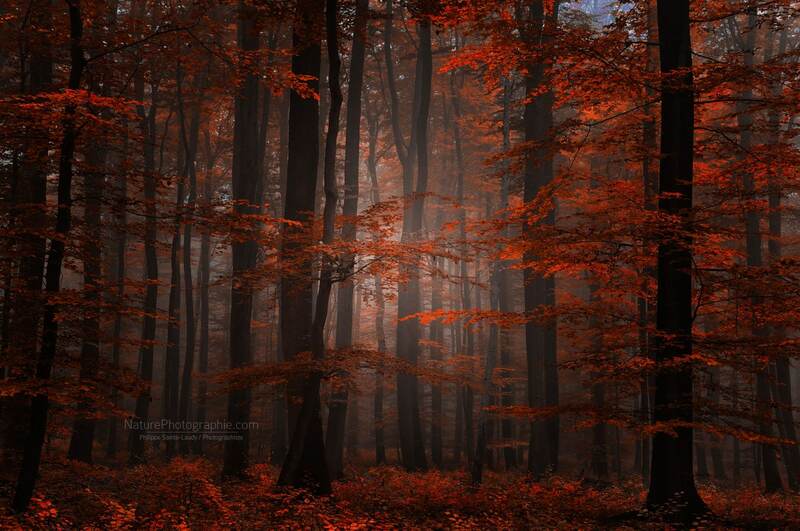 Hi, I’m Philippe Sainte-Laudy. I live near Strasbourg in France. My goal in the world of photography is to strive for originality, and create my images into an art form. I like photographing nature and in particular landscapes. Photographer by passion for years, today I have my own business. I also like optimizing and working my images with software such as Photoshop, Aperture or Lightroom. I hope that photography can bring people closer to nature and encourage them to preserve it for future generations. This photo was taken this autumn in France near Strasbourg. The season was beautiful this year! The woods were bathed in a light yellow to brown. Almost magical! I also used a tripod to get a good depth of field and bring out maximum detail. I used several layers set in Photoshop to optimize the atmosphere of this forest and give an artistic touch. Thank you to Darwin for allowing me to talk about myself without moderation. I shot with a Canon 5Dmk2 and Canon EF 17-40mm L. Exposure was 0.2 seconds at f/14 and ISO 160. The camera was handheld throughout and I panned vertically to achieve the ICM – it’s the first time I’d tried this technique and a concept I hope to revisit soon. Processing was done in ACR and CS4.